Jan 7th Chat – Resolutions, Focus and Goals – Oh My! At the end of every year at least one of the local television stations airs “The Wizard of Oz”. It’s a holiday tradition. 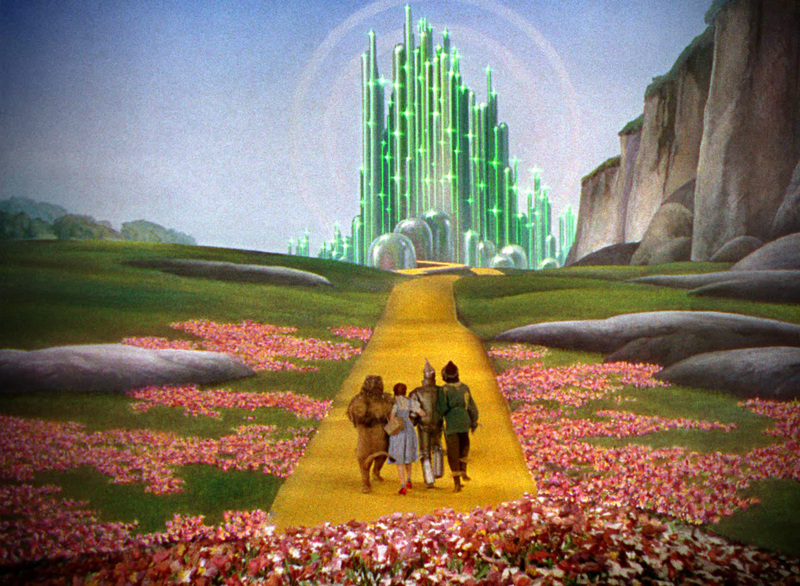 I never manage to sit through the entire movie (too many repeated viewings as a child), but I always seem to catch the part where Dorothy, Scarecrow, Tin Man and Lion cross through the poppy field and see their goal – Emerald City. It’s a great scene and it also reminds me that it’s time to set new personal and professional goals for myself for the coming year – another holiday tradition. When I young, my parents always insisted that my siblings and I write down New Year’s resolutions. I used to hate this exercise. Over the years, however, I found that when I looked back at the end of the year, I somehow managed to achieve a few of the resolutions/goals on the list. Now, I view this exercise as the key to having a great year. This week on #HCLDR we’re going to explore the topic of goal setting. Healthcare is full of goals: small reasonable ones like not showing up late for appointments and big audacious ones like 5,000,000 lives saved. As healthcare leaders we are expected to set goals not only for ourselves but for the organizations we serve. Join us Tuesday January 7th at 8:30pm Eastern for our discussion. T1: Do you believe it’s important to set goals in healthcare? What types of goals? Big? Small? T2: How would you encourage others to set goals if they are reluctant? Share effective tactics. T3: What personal goals have you set for 2014 (health-related, healthcare-related or other) ? Last year, prior to setting my goals for 2013, I decided to go online and learn from experts on how to set goals better. What I found was eye-opening…and confusing. A goal, according to Bregman, is “an outcome you want to achieve”. What he advocates instead is an Area of Focus which “establishes activities you want to spend your time doing”. Goals are results (example: $10M in revenue) whereas focus is a path (example: Having lots of meaning conversations with appropriate prospects). Bregman’s suggestion is supported by a Harvard study: “Goals Gone Wild: The Systematic Side Effects of Over-Prescribing Goal Setting” by Ordonez et al. In this study, the researchers talk about how goals can have detrimental side-effects such as: excessive risk-taking, unethical behavior, inhibited learning and depression at not reaching goals. They cite negative goal examples from Sears, Ford and Mt. Everest expeditions. It’s quite an interesting read. During my research I learned that one of my favourite stories about the benefits of goal setting is nothing more than an urban myth. Perhaps you have hear the story of the study done on a Harvard Business School class that showed that only 3% of the graduating students wrote down clear goals. Twenty years later those same 3% had accumulated wealth 10 times greater than the rest of the class combined. I learned that this “study” never actually happened. You can read more about it here. Luckily, Gail Matthews, a PhD from Dominican University, decided to conduct this study. Her results are fascinating. Results from Gail Matthews PhD study on Goal Setting. 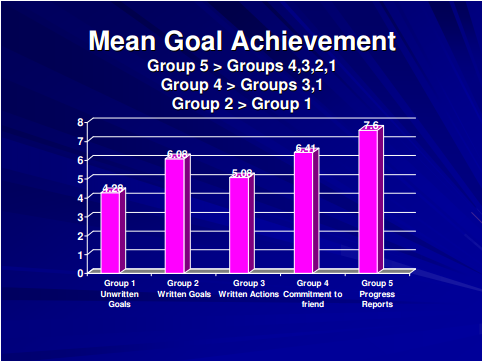 Matthews’ study shows that there is a general correlation between writing/reviewing goals and actual success. Happiness! More affirmation of goal setting comes from this wonderful article on the KeepInspiringMe blog “Why you need to set goals”. This article gives six solid reasons why goal setting is worth it. My favourites are #2 – Goals transform insurmountable mountains into walkable hills and #3 – Goals help us believe in ourselves. For a full list of articles, check out the Resources section at the end of this blog. So what’s my goal-setting philosophy? I break each goal into a series of targets that I believe are attainable, sometimes I end up with monthly targets, other times they are quarterly. I share my goals with a few close friends and family…sometimes I share one or two publically (see below). When I achieve a goal or one of the targets I reward myself – often times with something small like a nice lunch or a gadget accessory. I hope your goal setting is productive and that you achieve your goals in 2014. Happy New Year! I like a lot your post of today!! I’m completely agree with the importance of set goals not just for life, health care needs a lot because you can reach a lot if you now exactly what you want and how you will achieve the goal. I would like to add to your script one thing, If you want to reach a goal you need a plan to do it, without a plan, an strategie that challenges you in a good way and affordable sure you will stop, giving up and letting motivation away. Another important thing is you need a significative personal reward when you set the goals because the efforts could be high and if this is really important for you, so.. you’ll be agree to pay the cost and make all the efforts needed to achieve what you want. Thank you and see you on tweet chat!! Congratulations for your post! It’s genial! !